TeslaCEO Elon Musk announced on Twitter on Thursday that a lower-cost Model 3 was immediately available for order on the company’s website. The electric car will have a base price of $US45,000 and is eligible for federal and state tax rebates. Tesla shares were up almost 2% ahead of Friday’s opening bell. 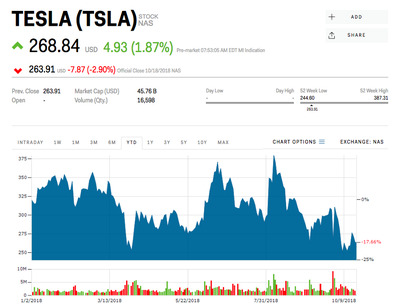 Tesla was gaining ground ahead of Friday’s opening bell, up 1.88%, after CEO Elon Musk revealed a lower-cost Model 3 sedan was ready for order on the company’s website. “Just released lower cost, mid-range Tesla Model 3 & super simple new order page,” Musk tweeted Thursday evening. The base price will be $US45,000, with vehicles delivered through 2019 eligible for federal and state tax rebates that could drop the cost to as low as $US35,000 in California. Musk said the real cost of the sedan would be closer to $US31,000 after gas savings. Until Thursday, the company had been offering only more expensive versions of the sedan. The Model 3 Performance has a base price of $US64,000, but that didn’t include options like the popular Autopilot driver-assist system. Tesla’s stock price has plunged more than 30% since its high on August 7, the day Musk tweeted he had “funding secured” to take the electric-car maker private at $US420 a share. Musk didn’t have funding secured, and he later settled with the Securities and Exchange Commission, which had accused him of misleading the public. As part of the settlement, he agreed to step down as chairman for at least three years and pay a fine of $US20 million. But the damage had been done to Tesla shares, which trade near their lowest level since January 2017. Traders will be watching closely to make sure it stays above the $US250 area – a key technical level – over the coming days. “The big and unanswered question is, will Tesla be able to achieve and maintain its targeted gross margins for Model 3 as mix deteriorates and average RpUs fall?” the Evercore analysts ask.